So you’ve decided to start learning R. Probably because someone in your institution, typically a gentleman with an unkempt beard who likes to rail on about open source software, has convinced you to abandon the comfortable GUI-driven statistics program you learned in undergrad. But it quickly becomes apparent that leaving the familiar point-and-click interface of JMP or Minitab or (horrors) Excel for the text-driven world of R isn’t as simple as downloading the software and hoping everything will just make sense. That’s where this type of book comes in. A Beginner’s Guide to R is a very well done attempt at introducing new users to the world of a text-based programming language. The book accomplishes its task by doing something a bit odd for a book about R: it dispenses with all pretenses of trying to teach you statistics. Instead, A Beginner’s Guide to R quickly and efficiently goes about the business of teaching you how to get R onto your computer, how to start it up, and then how to work it. The book assumes that you have almost zero experience with programming techniques such as for loops and if statements, so if those phrases mean nothing to you, this is your book. The authors spend most of the book teaching you how to get your data into R (from Excel, from other stats programs, from a text file etc. ), and then how to manipulate the imported data so that it can eventually be used for plotting and statistical modeling. The coverage of individual R commands is generally brief, but should usually be enough to start you off on the right track. As with any good book on R, the authors point out repeatedly that if you don’t understand a command or how to do something in R, go to the web and search the voluminous help files to get a better handle on each command. There are three chapters on basic plotting commands, certainly enough to make all of the common chart types you might need for a class project or manuscript. You’ll learn about the base graphics package as well as the lattice package and grid package for making slightly more intricate graphs. 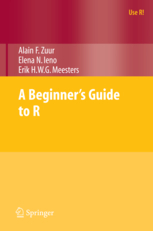 As with all of the topics in the book, A Beginner’s Guide to R remains somewhat light on the details of the full range of options available when graphing, but once again, the goal is only to get you started with R. Exploring the many subtleties of making fancy graphics in R is best left to dedicated books on the topic, but this book will at least get you comfortable with replicating the plots you were comfortable making in Excel. The major caveat for A Beginner’s Guide to R is that the book is written by Windows users, for Windows users. There is scant information provided on setting up R under Mac or Linux operating systems, nor much information given on finding a suitable text editor for those operating systems. The book also constantly makes reference to loading files from the directory “c:/Rbook/”, a decidedly Windows-centric bit of syntax that a Mac/Linux user will need to alter for their own uses (wrapping the data up in a package that could be downloaded from with R, as is done in many other R books, would have helped here). Besides these points, R code works much the same under all three OS’s, so once you’ve managed to get R up and running, everything else in the book will translate directly to a Mac or Linux version of R. The other major caveat with A Beginner’s Guide to R is that for some reason Springer have seen fit to issue it with an incredibly ugly yellow/orange/red cover that wouldn’t look out of place sitting on the counter of a kitchen from the 70’s with avocado green appliances and wood paneling on the walls. Unfortunately, all of the books in Springer’s Use R! series (of which this book is a member) seem to have gotten the same treatment. If you’re mostly clueless about computer programming in general, and R in particular, A Beginner’s Guide to R could prove to be an extremely helpful introduction. By dispensing with the statistics discussion, the authors successfully get the reader to focus on learning the basics of the R language that form the underpinnings for successful data analysis down the road (which you’ll have to learn from another book). At just over 200 pgs in length, you could get through the material in the book in just a few sittings, easily within the span of a week (or even a weekend) if you can dedicate enough time. If you have more of a programming background, and are more interested in learning the R commands that correspond to the commands you use in your favorite programming language, I think O’Reilly Media’s “R in a Nutshell” is a better option. Ultimately, I expect that once you become comfortable with R, this book will not get much use due to its basic level. But at that point, you can pass it on to a younger colleague after they succumb to your ranting and raving about free software (growing the beard is optional).